For “protection against electric shock under fault conditions“ in TN systems, overcurrent and residual current devices have been approved. For the use of surge protective devices (SPDs) this means that these protective devices may only be arranged downstream of the devices for “protection against electric shock under fault conditions” in order to ensure that the measure to protect against life hazards also operates in the event of a failure of an SPD (surge protective device). 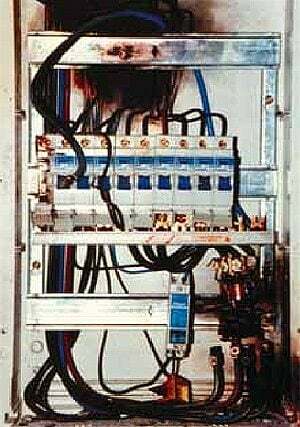 If a Type 1 or 2 surge protective device (SPD) is installed downstream of a residual current device, it has to be expected that, because of the discharged impulse current to PE, this process will be interpreted as residual current by a residual current device (RCD), and it interrupts the circuit. Definition acc. to IEC 61643 Definition acc. Moreover, if an SPD Type 1 is loaded with partial lightning currents it must be assumed that the high dynamics of the lightning current will cause mechanical damage on the residual current device (Figure 1 below). This would override the protective measure “protection against electric shock under fault conditions”. Of course, this must be avoided. Therefore both lightning current arresters Type 1 and SPDs Type 2 should be used upstream of the residual current device. Hence, for SPDs Type 1 and 2, the only possible measure for “protection against electric shock under fault conditions” is using overcurrent protective devices. The use of SPDs must therefore always be considered in conjunction with a fuse as the overcurrent protective device. Whether or not a supplementary separate backup fuse must be designated for the arrester branch, depends on the size of the next upstream supply fuse and the backup fuse approved for the SPD. Figure 4 illustrates an example of the connections for use of lightning current arresters and surge protective devices in TN-C-S systems. As a result of the frequency of switching surges in the terminal circuits, SPDs Type 3 are primarily employed to protect against differential mode voltages. These surges generally arise between L and N.
A surge limitation between L and N means that no impulse current is discharged to PE. Thus, this process can also not be interpreted as residual current by the RCD. In all other cases, SPDs Type 3 are designed for a nominal discharge capacity of 1.5 kA. These values are sufficient in the sense that upstream protective stages of SPDs Type 1 and 2 take over the discharge of high energy impulses. 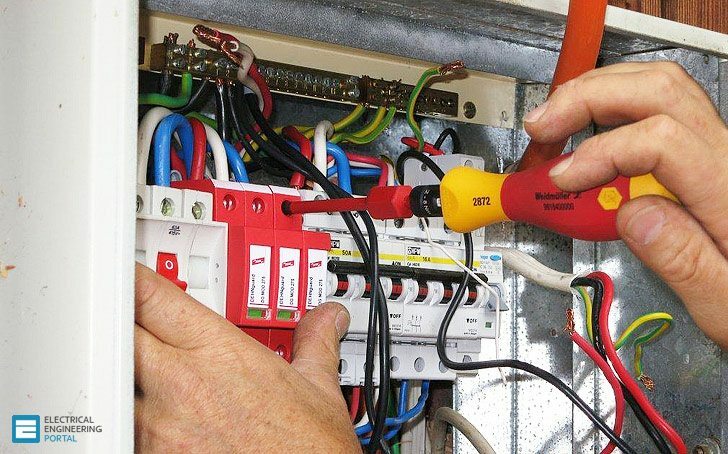 When using an RCD capable of withstanding impulse currents, these impulse currents are not able to trip the RCD or cause mechanical damage. The Figures 5 to 9 illustrate the use of SPDs as part of the lightning protection zones concept, and the required lightning and surge protective measures for a TN-C-S system.